Kovvograven is about 2.5 km south from the outlet of Lake Messlingen. 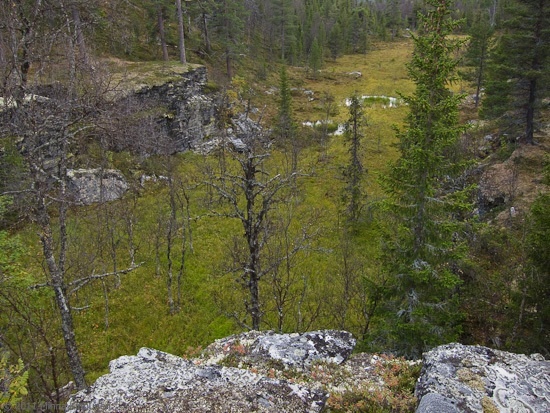 A legend says that during the war between Sweden and Norway, this ravine was a hiding place for the silver from the Hede church; the name “kovvo” means a hiding place and Härjedalen was actually part of Norway during that time. Kovvograven was also used for hiding food and necessities during times of unrest. Kovvograven is a small ravine with a slightly unusual profile. There is only one spot with cliffs on both sides, forming a kind of a gate with a mire below and a great view towards the big Storröstgraven ravine by the Blåstöten mountain. North from this gate, there is just a little bit of cliffs on the western side while the eastern side is a birch covered ridge with a mire in between these sides. If you go west from the cliff gate, you will get to a valley which is covered by spruce forest and you almost can’t even see the western slope of the valley until you reach it. I’m not a geologist so I can’t speculate how this formation was born but it’s interesting nonetheless, and different from all the other ravines with their cliff walls and random rock piles. If you’re interested in reading more about Kovvograven, check out my blog post about the ravine. Directions: Leave your car at the end of Sjövägen in Messlingen by the lake. Follow the trail on the lake shore until you reach the bridge over Mittån. Go over the bridge and take the trail marked Grundsjön. Shortly, you get to a trail crossing with signs towards Grundsjön and Mittån. Don’t turn here, but continue up to the little hill just ahead and now take a compass reading south. There is no trail going up (south is up) but all you need is rough southern direction to get up to the plateau. There’s a few mires on the way and depending on the conditions, they are more or less easy to cross. 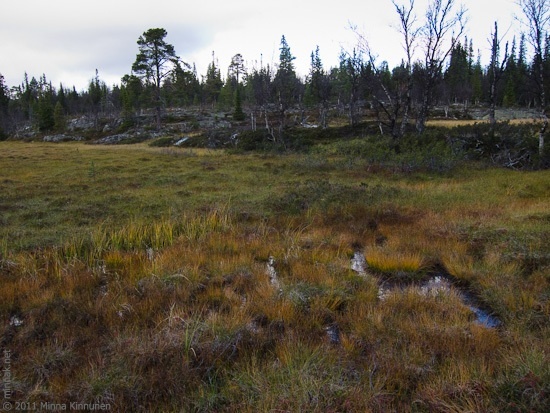 Aim to reach the plateau west from the Middagstjärnen tarn and then go straight south to the ravine. The ravine is so small with none of the normal precursors that flag of its existence that it’s possible that you miss it at first try. Just make sure that you don’t walk too far down in the spruce forest and follow an east-west axis until you come across the ravine. When you walk back from the ravine, ignore the path that you might come across. The path is old but it can be followed all the way down to the lake, but it will also take you too far to the west so you need to walk some extra to get back to the bridge. So your best bet is to go north from the plateau and go down the same way you came up. If you veer off from a straight course, there is no risk of getting lost because you will end up either by the lake or the creek so just follow the shore as needed to get to the bridge.